Dearest Patrons, Sponsors, Restaurants, Wineries, Florists, Donors, Musicians, Volunteers and Supporters of the United Way KFL&A’s Fare For Friends…..
Over the last 25 years, you have helped to grow this unique garden party into something truly remarkable. 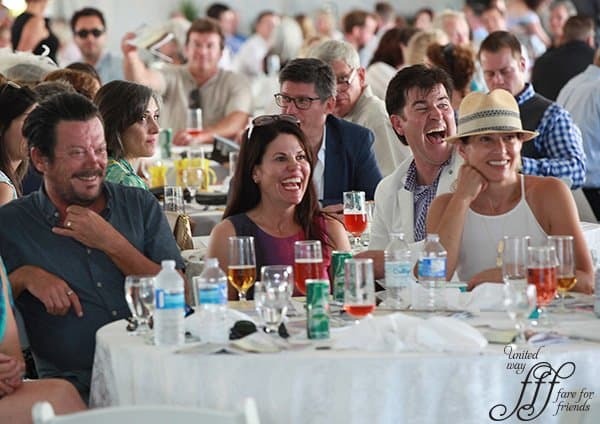 What started out in 1994 as an intimate event on the front lawn of Clark’s by The Bay, has grown into one of Kingston’s premiere events raising over 1.3 million dollars to support the agencies and services of the United Way of Kingston, Frontenac, Lennox and Addington. This is only because of YOU. What many people might not know is that year after year, YOU – the restaurants, wineries and florists all donated your product, your talent and your time in order to be a part of this community event. You didn’t have to. But you kept coming back and for that, we will be eternally grateful. This is the end of an era as we present the final, sold out, Fare for Friends. We thought it was only fitting to come back this year as Co-Chairs – to bring the event full circle and to help celebrate where this event came from and all that it has achieved along the way. We are a truly blessed community to have so many businesses and volunteers who recognize the importance of the United Way and the work that it does. Thank you for your support and your generosity… but most of all, thank you for your big hearts.